Developed to satisfy the popularity of this fast-growing segment of gardening. It contains everything you need to grow healthy herbs and vegetables, or beautiful flowers. This newly popular type of gardening combines the ease of access that raised beds provide with traditional gardening, and the results are equally as good. 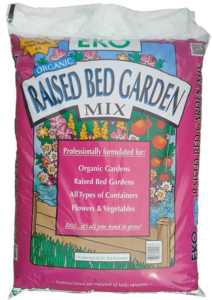 Whatever your gardening interest, EKO Organic Raised Bed Mix is the ideal product for your garden.